Y’all, we’ve a working group meeting tomorrow, Sunday, April 29. It’s the last chance we have to get ourselves settled before May Day, so everyone please show up. 6pm by the Gandhi statue in Union Square. It was on October 9th, 2011, that the Temporary Autonomous Zone by Hakim Bey was entered into the People’s Library database on Librarything, making it the first cataloged volume. It wasn’t too long after that when a few of us huddled under shapeless structures- makeshift and different everyday, like the rules imposed upon us by the men in dimly lit rooms- listening to the rain on the tarpaulin, discussing the T.A.Z., wondering just how ‘temporary’ our autonomous zone was. the T.A.Z. must be capable of defense; but both the ‘strike’ and ‘defense’ should, if possible, evade the violence of the state which is no longer a meaningful voice. the sound cannon, truncheons in gloved hands, the cleaning of pepper from the eyes of my friends, Orwellian visions. often one returns to Liberty Plaza: vacant; lighted holiday trees; library space sans tombs; police-tape demarcating an unknown crime; strange encounters with uniformed men in mustaches. there are waves nostalgia of course, but the sentimentalism dissipates, though never entirely; it lingers a safe distance away–never impeding future action– and allows me to somehow safely hold our encampment of guerilla ontologists in unforgettable synaptic locations. “Why?” I heard a woman say today, as I rounded the corner to a crowd of hundreds, a march and Solidarity Act, for those immigrated to this country. must we wait until the entire world is freed of political control before even one of us can claim to know freedom? the rain fell on tarps that night in october, we huddled and laughed, the Fiddler played from his bivouac, from somewhere under the sky we knew our Zone was temporary, we knew these as processes, and not merely results. there are those that cling to the space–what we call Liberty Plaza. But the TAZ liberates an area (of land, of time, of imagination) and then dissolves itself to reform elsewhere, before the state can crush it. 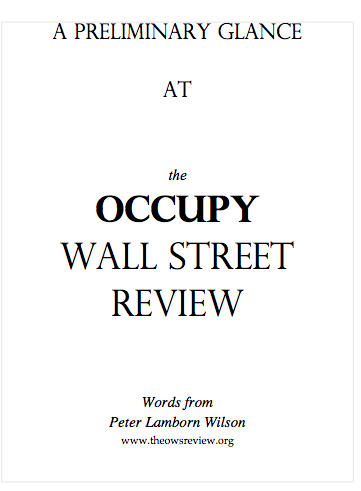 the following precursory text of the OCCUPY WALL STREET REVIEW was made available at the request of Peter Lamborn Wilson for the occupiers on the day of action, D17. It seems to be the phrase of the Occupation, and especially apt in the past week or so. There was the Law & Order set thing. In case you missed it, dear readers, Law and Order: SVU built a fake occupy camp in Foley Square last week, as a set for an episode. It had tents, a kitchen, a library, police presence, all that stuff. Of course, the real occupiers found it, and, late on Thursday night, occupied it. I ask you — did they think we wouldn’t? You can find info on twitter and elsewhere about it under the hash tag #mockupy. Mother Jones has a short article on it, with video featuring some of the real librarians from the People’s Library. A while back we instituted an infrequently-used hand signal at library meetings to go with all the up-sparkling, down-sparkling, points of process, and so forth: the clarifying mustache. You take the curved pointer finger part of the clarifying question signal and put it over your upper lip. It means that things have gotten completely ridiculous, and we all need to take a Dada break. With the mockupation, the universe seems to have gotten on board with it, no? In amongst the absurdity is the former location of the People’s Library in Zuccotti Park. In the first few days after the eviction last month, the people’s librarians were persistent in reopening the library. Over and over and over again. We were some of the first folks back in the park that morning — until we were kicked out again — and we’ve since had as much presence as the NYPD and Brookfield security dudes will allow on any given day. Recently that hasn’t been much. A couple weeks ago the security dudes put up some red cloth “Danger!” tape between the trees in the northeast corner of the park, blocking off the benches where the Library used to be. The official reason was to protect the brand new ornamental cabbages that Brookfield had planted in the garden area above the benches. Cabbages that they had to tear out the existing bushes to plant, let me add. If you think that sounds completely ridiculous, take a moment to make the clarifying mustache signal with me. See, among us persistent librarians, there’s one particularly persistent librarian. For the terrible crime of bringing books into the park he’s been bum rushed by a score of cops and nearly arrested, had some of the books confiscated, and, now, been banned from the park. The above document is the result of the confiscation. After those five very dangerous books were taken — we are told that one may not put books on the bench, because it prevents people from sitting there — the police delivered this kind note to the park. Not to the Library or to a librarian, but just to the park, asking that it be passed along to Library. Now, I know that’s more or less how it work here on the movement side of things, but I’m pretty sure the cops’ rules require them to be a little more diligent than that. Since then, the red tape blocking off the former location of the People’s Library has been replaced by authentic yellow “Crime Scene Do Not Cross” cop tape. (Someone should confiscate that, it’s preventing me from sitting on the bench.) Do you have that clarifying mustache ready? Because I know we joke a bunch about how the City has been making books illegal, but someone obviously lacks in the irony department; how else to explain the utter tone-deafness of this whole thing? Anyway, for once the NYPL has taken good care of our confiscated stuff. Which means we’ll surely be making the trip up to 1 Police Plaza to reclaim it shortly. I hope you’ll join us. In the mean time, at least the current Christmas light overkill on all the trees in Zuccotti throws off enough glow to read by? Jaime & Betsy: Who’s going and who wants to go, details. Betsy was invited by the ALA Conference Planning Manager to present at this year’s Midwinter conference. Betsy negotiated w/ALA to pay airfare & hotel for more of us to attend & present collaboratively. Betsy, Mandy and Zach are all scheduled to attend. We want to talk about who else wants to go, how to pay for it and to co-ordinate flight & hotel information so we can go together if possible. The conference is in Dallas from Jan 20-24, 2012. Our panel is scheduled for 8:30-9:30 am on Saturday Jan. 21st. I’ll email the group my flight details & hope Mandy & Zach can do the same. We decided to table this issue to discuss later because a lot of people were missing from the meeting. Frances: Monday night’s spokes council meeting at Murry Bergtraum High School 411 PEARL STREET (Just East of City Hall) at 7:30PM will determine whether groups are operational groups or movement groups. We discussed the differences between the two and worked on filling out the form we need to submit tomorrow at spokes council. Basically, operational groups handle day-to-day operations within the park and are different from movement groups which address/represent concerns that are movement-wide. We consensed (is that really a word?) that we are an operational group. It is essential that our space exists within the park, we serve a vital function & take up space in a way that is very similar to comfort or kitchen. We provide a safe, welcoming open space within the park. Being a caucus with other groups (like info or media) doesn’t mean that we lose power, it’s just a change in position within the spokes council. We agreed that becoming an operational group is the way to go & if that’s not possible for some reason, we would like to be an independent caucus. We occupy a lot of park real estate & have a lot of stuff. The library serves as a support to other caucuses. Hristo proposed we all get matching tattoos. Tabled for later discussion. 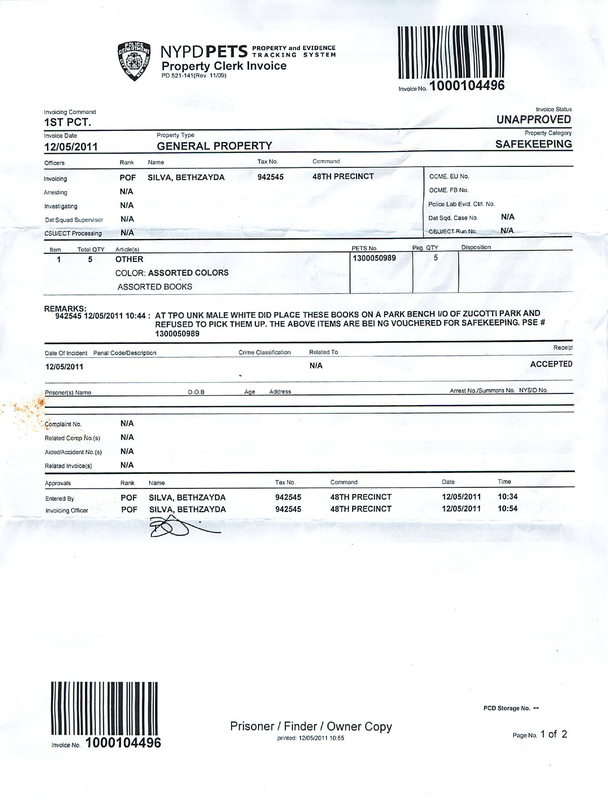 Bill reports that he was approached recently by someone offering the library office space. That person should be contacting us soon via email. We discussed and agreed that it would be nice to have a place to get some work done out of the cold as long as it’s within walking distance. SIS doesn’t really want us in their space anymore, even for cataloging. Michelle: the Melville marathon reading is coming up Thursday at 3 pm at 60 Wall street. Let’s promote it. She’s going to make fliers. Frances: is making a library guide in google docs and would like everyone’s input. It will be a basic guide for people who are new to the library for our practices and ways they can help when they arrive. Please add ideas. Also, Frances will be occupying the Magic Kingdom for the next week.